At the invitation of State Councilor and Foreign Minister Wang Yi, Gudlaugur Thór Thórdarson, Minister for Foreign Affairs of the Republic of Iceland, will pay an official visit to China from September 6 to 10. Q: According to a report, an anonymous source from the US government said that the large amounts of loans China provides to the Pacific island countries will make them highly indebted and the US is concerned about that. In the meantime, the US, Australia, France and the UK plan to set up new embassies in the Pacific island countries and scale up economic assistance in this region to counter China's influence. What' your comment? A: This report you mentioned quoted from an interview with an anonymous source. I remember that recently President Trump tweeted that when you see "anonymous source", stop reading the story, it is fiction. I was wondering whether this report is one of that kind. There are some Western media that have been playing up the so-called "China debt trap" issue. I can't help but wonder why the money is "money pie" when it is offered by the Western countries but "money trap" when offered by China? Isn't it glaring double-standard? I shall point out that the relevant Chinese loans have no political strings. We pay high attention to the debt sustainability of the recipient countries and fully respect the will of their governments. By funding infrastructure and other areas that lag behind for short of money, we have helped the relevant countries break bottlenecks, enhance their capacity for independent development, realize social and economic sustainable development, and improve people's livelihood. The governments and people of the recipient countries warmly welcome that. I would like to advise the relevant people to stop setting up roadblocks when others are helping build roads. They should join China to do something real good for the development of other countries. Q: The White House statement once again expressed doubt over China's role in resolving the Korean Peninsula nuclear issue. 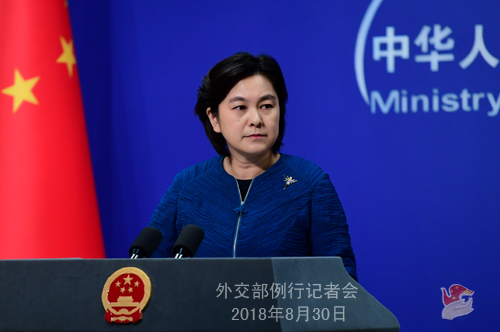 The US said the DPRK issue is partly caused by the China-US trade disputes, and the DPRK is under tremendous pressure from China because of the disputes. What's your comment? A: Many may share this feeling with me: the US is the best in using twisted logics to irresponsibly distort facts. But their absurb logic is really beyond the apprehension of ordinary people. All these days we have been reiterating China's policy and stance on the Peninsula issue. 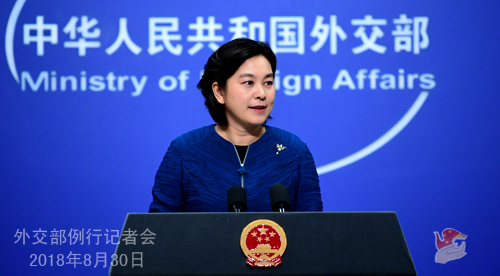 I would like to stress again that China's foreign policies, including that on the Korean Peninsula issue, is clear and consistent, which has strong stability and consistency. We hope the US will honor its words and play a positive, constructive and responsible role in promoting the political settlement of the Peninsula issue, just like China does. In face of the setbacks and difficulties at this point, it should find out and reflect upon its own problems, rather than flip-flop and shift blames on others. The US wants to make China a scapegoat. But so sorry, we don't want to be one. And don't even think of making us one. Q: A Japanese government official lodged protests with China over the Chinese Foreign Ministry not allowing the Sankei Shimbun to participate in a pool interview of their Japanese Vice Foreign Minister. What's your response? Could you tell us the reason for that rejection? What reports have the Sankei Shimbun made that China finds problematic? A: I just saw the relevant remarks by Japan's Chief Cabinet Secretary Yoshihide Suga, which we cannot accept. Did you attend our press conference yesterday afternoon? Those who were here may remember that a Japanese journalist asked about one Japanese media being barred from the pool coverage. I was not aware of the situation back then and promised to check on the matter. Since then, the Sankei Shimbun has reported this morning that China "illegally" rejected its lawful request for coverage, and this afternoon a Japanese official has made remarks on this issue. All these false accusations make up a good drama of blame-shifting. 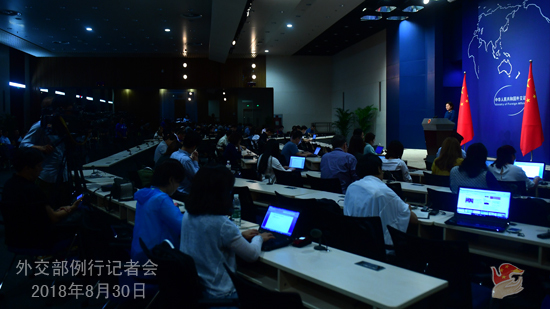 Resident foreign correspondents in China understand that the media coverage of any important diplomatic event is arranged through friendly talks between the host and the visiting countries under the principle of mutual respect, amity and reciprocity. The number of correspondents allowed in will be properly managed in light of the conditions of the event venues to ensure order and security. I do not believe you would have any problem with this. (Journalist nodded) That is also how yesterday afternoon's event was arranged. As far as I know, one hour in advance of the event, the Nihon Keizai Shimbun, the NHK and the Yomiuri Shimbun all confirmed their attendance to the staff of the Information Department of the Foreign Ministry, but things did not turn out that way later. I was wondering whether they made that choice on their own or under the pressure of others? I hope the Japanese government, especially the Japanese Embassy in China could give us an answer. As for why the Sankei Shimbun was not allowed in for the coverage, I shall say China has always been helping and facilitating the work of resident journalists in an active and friendly manner. Have you encountered any barriers when attending our press conferences here? There are 28 Japanese media and around 100 Japanese correspondents in China. I suppose they haven't met any restrictions or problems in their reporting. The Sankei Shimbun accused the Chinese side of "illegally" blocking their "lawful" coverage. I would like to ask this question: there are over 600 foreign correspondents in Beijing, does "lawful" mean we have to get these 600 correspondents all in for each and every diplomatic event? Is the legality of this whole thing dependent on the attendance of the Sankei Shimbun? Can it be said that their appearance makes it "lawful" and disapperance "unlawful"? Therefore, I think both the Sankei Shimbun and the relevant Japanese official need to get a sober, clear and correct understanding of this issue. The international practice of making coverage arrangements through bilateral negotiations should be respected. We want to maintain good ties with all foreign media and calmly talk about each other's concerns, wishes or requests. The Information Department will remain as dedicated to providing convenience and service to foreign correspondents for their work in China. You can always talk to us in case of any problem and we will properly work it out for you. Follow-up: What's your response to the protest lodged by the Japanese official? A: We won't accept such unreasonable protest. The Japanese government should guide and restrain the Japanese media, asking them to abide by the laws and regulations of China and other countries they work in, make objective and unbiased reports, and contribute to bettter understanding and cooperation between the two sides. They should play a constructive rather than destructive role to this end. This is common sense and we hope the relevant Japanese official will come to realize that. Q: China's Supreme People's Court (SPC) has established a committee of international commercial experts. What are the considerations behind setting up this committee? A: As the Belt and Road Initiative (BRI) celebrates its fifth birthday this year, international cooperation on this initiative is also faced with important opportunities. Just like State Councilor and Foreign Minister Wang Yi said at the Forum on the Belt and Road Legal Cooperation which was held in July that rules and rule of law are essential for the BRI to develop in the world, and they are also the safety valve against uncertainties and challenges. China attached great importance to the Belt and Road legal safeguards and cooperation which is an indispensable and fundamental part of the BRI. In the BRI cooperation documents we signed with other countries, there are clear stipulations of shouldering each other's obligations under international law and observing domestic laws and regulations, which demonstrates that the BRI respects the universal international law as well as the domestic laws of respective countries. Following the heels of the Forum on the Belt and Road Legal Cooperation in July, the SPC's International Commercial Expert Committee was officially established on August 26. As an important institutional innovation for the BRI legal cooperation, it will promote the just, professional and efficient settlement of international commercial disputes, ensure a stable, fair, transparent and predictable law-based business environment, thus ensuring more legal and institutional support for the BRI. The BRI has entered a new phase of comprehensive and practical cooperation, the BRI legal cooperation is also placed at a new starting point. We will continue to uphold the principles of extensive consultation, joint contribution and shared benefits, enhance the correlation rate between China's national standards and international ones, improve legal safeguard system, create a law-based business environment, and ensure high-quality and high-standard BRI development. Q: Some US lawmakers called for the US government to impose sanctions on Chinese officials responsible for "human rights abuses against minority Uyghurs in China's Xinjiang". What is your comment? A: If China's policies on ethnic minority groups and the equal rights enjoyed by them are viewed without bias and prejudice, the conclusion will be drawn that China's policies and record in this regard are actually far better than the US. The Human Rights Record of the US released by the Information Office of the State Council enumerated various problems facing the US in terms of racial discrimination and human rights protection. These US lawmakers have no right to make these unwarranted accusations on ethnic minority issue against China. The Chinese government protects its citizens' right to freedom of religious belief and people of all ethnic groups enjoy freedom of religious belief in accordance with the law. We hope the US side could recognize and respects facts, discard prejudice and stop doing or saying anything to undermine mutual trust and cooperation between the two sides. I would like to advise those US lawmakers, who are paid by taxpayers' money, to focus on doing their job and serving the Americans, instead of poking their noses in other countries' domestic affairs, acting as some kind of "human rights judge" to make groundless accusations, or even threatening to impose unreasonable sanctions. Q: Does the Foreign Ministry have any comment on the Bloomberg New Economy Forum scheduled in November being moved from Beijing to Singapore, including reports that China-US trade frictions may have contributed to that decision? A: You need to ask the host of this event. Q: Reports say that China and the Vatican will hold a new round of talks in September. Can you confirm that and is an agreement on appointment of bishops going to be signed in October? A: China and the Vatican maintain effective communication. China is sincere towards improving ties with the Vatican and has been making continuous efforts. We stand ready to meet the Vatican halfway to promote constructive dialogues and further improve relations. Q: In response to the Civil Aviation Administration of China's demand to classify "Taiwan" as "Taiwan, China", the United Airlines' website shows that mainland, Taiwan and Hong Kong can be selected as locations according to the currency. The spokesperson of the department in Taiwan in charge of so-called "foreign affairs" expressed appreciation for such "flexible workaround". What is your comment? A: I would refer you to the Civil Aviation Administration for details as they are in charge of this specific issue. I just want to stress that there is only one China in the world and Taiwan is part of China. This is the objective fact, common sense and international consensus. It lays out a basic principle for foreign companies operating in China to follow. However flexible they may try to get, there is simply no way to sidestep the one-China principle.